To report all environmental pollution incidents, call the environmental pollution hotline on 0800 80 70 60. These reporting channels are vital to safeguard the hills and maintain vigilance on major ongoing issues. Landfill, planning, illegal dumping, litter, dog fouling, fires and pollution are all of enormous concern to us all. The Partnership however is confident that these can be addressed with the right support. With sustainable management, the Belfast Hills can improve and undergo a renaissance of interest and development for the benefit of all. So use the hotline or get in touch with us at 028 9060 3466 (office hours only) or info@belfasthills.org. If you would like a card posted, just call or email us. The card also carries the following useful council contacts. Human safety is vital and it only takes the wind to change for either the people starting these fires or an innocent hill user, to be caught up or disorientated because of the smoke. Red grouse, stonechat, skylark, snipe and other upland breeding birds live in the Belfast Hills, while peregrine falcons and ravens feed on the mountain environments. Our only species in Ireland of- the common lizard – also lives in the hills. Fire can destroy these wildlife populations and wipe out nests and habitat. The affect of malicious fires is also extremely serious for soil erosion and water draining off the hills. This could lead to flooding in communities below the hills in the long term. We commend the work of the Northern Ireland Fire and Rescue Service and PSNI in putting out these dangerous fires. Remember, when the fire brigade are out on the hills tackling blazes, there may be less resources for fire emergencies among residential communities that could lead to needless loss of life. Remember even if you have no credit in your mobile phone and see a fire, you still can call 999. Don’t assume that someone else will be doing it. If you would like some fire cards, just call or email us at 028 9060 3466 (office hours only) or info@belfasthills.org. Landfill in Northern Ireland is currently in a state of flux. Waste management licences, formerly issued by councils, were transferred to the Northern Ireland Environment Agency NIEA) a few years ago. Waste management licenses have been replaced by PPC (Pollution, Prevention and Control) permits. These new regulations were aimed at bringing in tighter controls. In a 2005 report commissioned by the Belfast Hills Partnership, the North of Ireland had over 100 licensed landfills, of which 38 of these were located in Belfast. Some 15 licensed landfills were found within the Belfast Hills Partnership’s operational boundary (excluding Cottonmount, Aughrim and Mullaghglass). When compared to similar locations on the edge of Dublin, for example, there were significantly higher levels of waste activity in the Belfast Hills than the Wicklow and Dublin Mountains. In Co Dublin there were five licensed landfill sites and to the north, Fingal County Council had two waste facilities. After licence permits were issued for Mullaghglass, Aughrim and Cottonmount treatment facilities (Cottonmount is approx 2km outside the Belfast Hills study area) the permitted levels for municipal waste in the Belfast Hills were estimated to be in the region of 66 per cent of the total NI level. 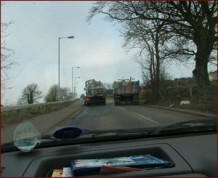 The 2005 report suggested that illegal landfill waste in Northern Ireland was in the region of 0.5 million tonnes per year. Throughout the whole of Northern Ireland, there was a ratio of one waste facility per 75km2 in comparison to one facility per 10.6km2 for the greater Belfast area. By contrast, the Belfast Hills area had a higher density of waste facilities with a ratio of one site per 2.7km2. There are two areas of deep concern to the Partnership. Firstly illegal landfill in the Belfast Hills, and secondly flytipping. There has been a lot of concern in the past about the perceived lack of teeth in terms of monitoring and enforcement at illegal dumping sites within the Belfast Hills. There seems to be a slight improvement on the issue of illegal landfill with fines imposed for those who flout regulations. Nevertheless, the wheels of justice seem to grind slowly for those directly affected by illegal landfill sites. Questions are often asked as to why, if a certain site is illegal, the authorities don’t shut it down rather than the environment and those affected by illegal landfill having to wait months and years before a final court prosecution and action. The Partnership and legal waste management operators have been continually voicing concerns over the need for urgent action to prevent the environment and residents living near such sites being blighted. Flytipping is also an historical issue in our local hills whereby people take refuse and simply dump it regardless of the farmer, road user, walker or wildlife it will affect. Flytippers are not regarded as the most clever of characters as most of the types of waste they dump can be disposed of for free in council amenity and recycling centres. We all have a part to play in putting a stop to this irresponsible and dangerous behaviour and this is where reporting is vital to stop these highly damaging practices in the Hills. The Belfast Metropolitan Area Plan (BMAP) is a development plan for a large area of Northern Ireland dealing with housing, employment, environment and transport for the next generation. It was launched in November 2004 and covers the council districts of Belfast and Lisburn and the borough councils of Carrickfergus, Castlereagh, Newtownabbey and North Down. It will impact on a population of 650,000, representing 40 per cent of people in Northern Ireland and it includes proposed initiatives in a number of areas relating to planning for the future. The Partnership has been proactively involved in the consultations and responded to the initial report; raising issues of concern in housing encroaching into the Belfast Hills, access to the Belfast Hills and landscape designations. The areas the Partnership has responded to include housing proposals at Lagmore, Colin Glen, Hannahstown, Whiterock, Ligoniel, Antrim Road and Carnmoney Hill. We appeared at the BMAP inquiry as another voice for the hills, conscious that conflict can arise between communities, developers and Planning Service. We went through all 3,700 initial responses to the BMAP proposals and submitted our responses; pinpointing our concerns about access routes that had been marked in the plan and proposed housing developments that are located close to areas such as Colin Glen valley. We counter-objected to 30 local plans – most of which were seeking to build housing further up into the mountains. We appeared in front of the public inquiry, making sure that the local environment had a platform at the proceedings. The inquiry sessions have been running since May 2007. In 2014 the Department of the Environment (DOE) gave the green light to BMAP 2015. With 14 years in the making, a question mark has been hanging over implementation with the threat of judicial review after claims that proper procedures were not followed by the sitting minister. The Partnership will continue to scrutinize BMAP and place objections were needed while working in partnership with all those involved in the Belfast Hills. Examples of the types of applications to which the Belfast Hills Partnership responds include landfill and quarry applications, housing schemes in which over a certain number of units are proposed, proposals which would breach a development or environmental stop line, and developments which have an accompanying Environmental Statement (Environmental Statements are only provided for major works). The Belfast Hills Partnership endeavours to consult with community groups and individuals to express the concerns of local residents. When responding to a planning application letters are sent not only to Planning Service, but also to the applicant to encourage communication on all levels. Local government management of the Belfast Hills has changed with the Review of Public Administration (RPA) with new boundaries meaning councils reduced from 26 to 11 in 2015. The new arrangements should mean people have a greater role to play in issues of planning and regeneration. Changing planning procedures mean planning decisions have transfered from the Department of the Environment (DOE) to local councils. One of these changes is how councils are supposed to involve local communities in not just planning proposals, but also a range of community development and regeneration. The NI Waste Management Strategy was created in 2006 and a plan produced. The strategy will decide how Northern Ireland will manage its waste and could have direct concern for the Belfast Hills. The strategy document consisted of a range of complex and technical documents, which the Partnership responded to in the consultation process. Arc21 is a waste management group that seeks to comply with Article 23 of the Waste and Contaminated Land Order 1997. In 2000, 11 Councils had joined together to form the Eastern Region Waste Management Group or Arc21 for short. These include an area ranging from Ballymena to Downpatrick and from Antrim to Portaferry. It is Arc21 that awards contracts for these 11 council areas, including existing contracts for Cottonmount and Mullaghglass – so-called ‘superdumps’. Arc21 has also published a Waste Management Plan, with many issues contained in it such as the requirements for major waste treatment facilities known as “energy from waste” that can include an incinerator. Arc21 makes the case that these facilities are essential to divert waste away from landfill and avoid massive EU fines. In September 2008 our black bin waste took a step closer to being processed in a radically different way after an initiative to install new waste facilities was kick-started by arc21. To do this Arc21 will be building two new types of waste facilities. One is an Energy from Waste (EfW) facility, which is commonly referred to as a waste incinerator. EfW recovers heat and electricity by burning waste that is not suitable for recycling. Recent press reports have suggested that Dargan Road on the North Foreshore is earmarked for a new EfW treatment plant. The EfW facility is due to be built by 2011 and operational by March 2014. The second is a Mechanical Biological Treatment (MBT) facility and Arc21 has begun a major procurement process to install two plants. An MBT system is a form of waste processing operation that combines a sorting facility with a form of biological treatment such ascomposting. MBT plants are designed to process mixed household waste as well as commercial and industrial materials. The two MBTs are due for completion also by 2011, to be ready to treat and sort the first consignment of waste in 2012. The massive contracts to build and run these facilities will attract the attention of international companies, cost many millions and would be expected to run for 25 years. The plans may affect the Belfast Hills favourably by diverting waste away from landfill. With the initiative at such a preliminary stage, however, there may be a possibility that one or more of the MBT facilities could end up in the hills. 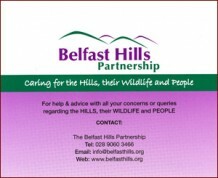 Anyone wishing to gain further information can logon to www.arc21.org.uk or email info@belfasthills.org or contact the Belfast Hills Partnership directly on 028 9060 3466. Waste, quarrying, housing and their resulting traffic are some of the driving issues faced when it comes to the impact on roads that serve the Belfast Hills. These roads are not built for these high levels of traffic especially vehicles carrying heavy tonneage. The Partnership estimates that up to 700,000 tonnes of legal landfill and in the region of 150,000 tonnes of illegal waste is disposed of in the Belfast Hills every year. A definitive figure is not ascertainable because no one except the Belfast Hills Partnership is looking into this local issue. This amount of waste equates to an estimated 34,000 lorry journeys in the Belfast Hills every year. Alarming as it is, this figure does not take into account HGV through traffic, quarry and other commercial traffic using these narrow roads. The Partnership is also deeply concerned that there is no overall approach to this issue with traffic impact assessed on an individual planning application basis. This means there is no apparent measurement of the culminative effect of multiple landfills and new housing. That these issues do not seem to be assessed can lead to major problems especially on key roads such as the Ballycolin Road and the Glen Road. The effect of this culminative growth of traffic has impacted on pedestrians and other road users’ safety. Many residents and visitors tell us the busy roads are too dangerous to walk. Traffic also has an adverse affect on hedges, drains and the visual quality of the routes along the hills. This is particularly the case with attendant rubbish falling off vehicles as well as refuse which is thrown from moving cars. The Partnership is spearheading a push towards an overall strategic approach as to how we can properly manage the Belfast Hills for business, for residents and for recreation.